The United States boasts a colorful and varied military history. From the first English settlements in North America to the present, the U.S. military has evolved from poorly trained militia formations into the world's most powerful professional military establishment. During that time our nation has fought almost every type of war, from guerrilla engagements to global conflicts. In many ways the U.S. military reflects the society from which it evolves; in more recent years, especially, the military has also had an impact on civilian society. Understanding the history of America's wars and its military establishment can help us to understand ourselves and our world a bit better. 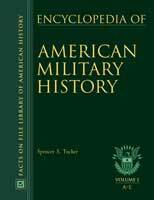 Presented in three volumes, the Encyclopedia of American Military History is a comprehensive overview of this fascinating subject, spanning the period from the colonial wars to recent times. More than 1,200 entries cover military leaders, wars, campaigns, battles, events, famous soldiers, military branches, key technological developments, overviews of weapons systems, and more. Giving special attention to the minorities and women who have contributed significantly to American military success, all three volumes contain inclusive, insightful, and interesting information on an array of individuals and topics from America's military past. Several complementary features allow the reader to gain further insight into the most important topics. The 200 black-and-white photographs of famous military personnel, battlegrounds, weapons, and technological innovations bring the text to life. Maps help locate events, and a glossary defines basic military terms that may not be familiar to students and general readers. The selective bibliography is easy to use and is divided into three categories—general reference works, monographs by chronological period, and encyclopedia and atlases—guiding users to valuable sources for further research. "...this work is well organized, has an easy-to-use format, and presents clear and well-written entries...wide-ranging coverage...Librarians and patrons alike should find this encyclopedia extremely useful." "...a superb work...easily accessible to general educated readers of virtually any age as well as to specialists...Highly recommended." "...a comprehensive and informative overview of the subject...A comprehensive, user-friendly resource." "...easily accessible to general educated readers of virtually any age as well as to specialists...Highly recommended." "A handsome, three-volume set...[an] excellent work...all entries are accessibly written and reflect the knowledge and clear writing style of the author. Highly recommended for larger high school and public libraries." "This set does an excellent job...The entries are easy to read, and the entire set presents a pleasing appearance...This work would make an excellent addition to high-school, public, and academic libraries." "Editors' Choice Reference Source, 2003"